Starting today, the Japanese Twitter account for Fire Emblem Heroes is running a daily community quiz, with a bunch of Orbs and Hero Feathers up for grabs. Each day, for up to 15 days, there will be a Fire Emblem-related multiple choice question posted on Twitter. If the correct answer gets the most votes, all players will receive a prize. 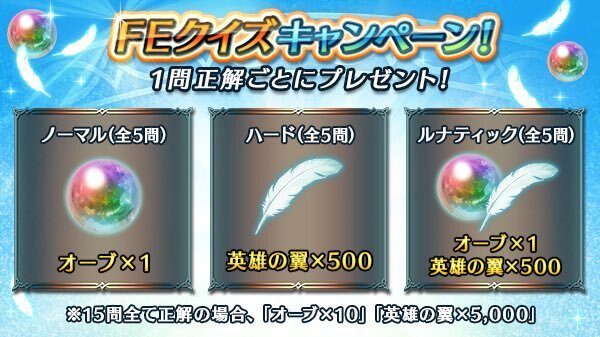 If all 15 questions are answered correctly, players can look forward to 10 Orbs and 5,000 Hero Feathers! Prizes can be obtained in-game from 7th April 2017. Right now, the quiz is for Japan-only, but chances are everyone will get the prizes. Hopefully. 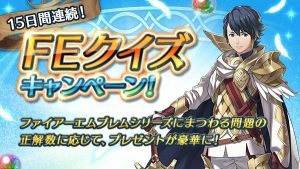 In Fire Emblem Heroes, what is the name of the Kingdom of Askr’s special unit? By the way, in the Japanese version, the “Order of Heroes” is known as the “Weiss Braves”, which literally means “White Heroes”. “Brave” also seems to be the game’s internal codename. If you’re interested in following the quiz, but don’t understand Japanese, we will try to retweet the daily questions with English translations on our Twitter account. The answer is obviously Sable Knights; duh!